Number 1 is your best friend - anything you type in regarding the case (its name, number, client, counterparty or court) will make the case pop up. After it does, you can click on the case (or client) name to quickly get to the bottom of things (2). Or, you can type a search term in the box (3) - this way you can quickly find a document, e-mail or task. 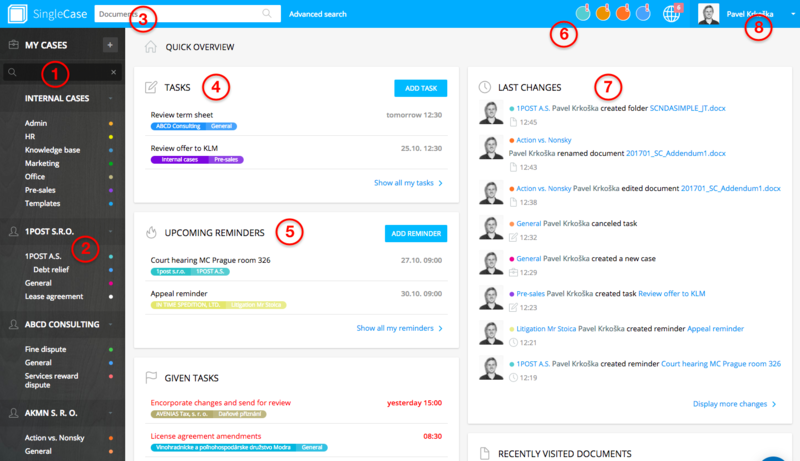 Main page contains a dashboard with all your upcoming tasks (4) and reminders (5). The little circles are notifications - you probably updated a document, sent out an e-mail or finished a task. Now, you can quickly turn in your timesheet (6). Anything happened in your cases while you were out? Find out quickly (7). Last but not least, you can access your timesheets, overviews and get to the settings by clicking on your profile picture (8).